A former director with the Santa Clara Valley Water District board says the agency deserves much of the blame for the flooding in San Jose last week. Sahib "Cy" Mann is questioning why the agency didn’t use inflatable dams along Coyote Creek after Anderson Dam's overflow caused the creek to breach downstream in San Jose. In the city's Rock Springs neighborhood, the creek runs downhill and makes a sharp turn to the right, and that is where the early breach presumably happened. Mann says it was preventable. "I don’t see anyone having a viable excuse for this," said Mann, who added that the district has portable, inflatable dams to keep the rushing water away from homes. "We had a deployment plan for this particular issue if there’s any kind of massive flooding." The water district says they didn’t use the portable dams because there is no flood control project along Coyote Creek to make them useful. Using bladder dams on the creek would redirect flows and potentially cause flooding on other properties, the district said. On Feb. 20, water district engineers were working at the creek, measuring the water level. 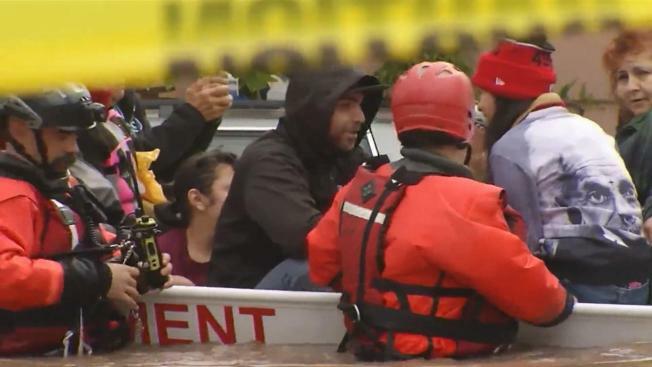 By the next morning, parts of San Jose were underwater, prompting thousands of people to flee their homes and causing more than $70 million in damage. "I'm shaking my head in disappointment because this whole thing could have been prevented," Mann said. He insists the floods were not a natural disaster but human-caused because they were triggered by a combination of the spillway release and weeks of a controlled release at Anderson Dam in Morgan Hill, with no coordination to respond to the consequences downstream. The water district disputed the accusation, saying the flooding was a result of too much water in too little time. District officials said they will leave no stone unturned in reviewing and evaluating what was done this time and what could be done in the future to improve procedures.